Motorcycle weekend trip with my son, April 2019. With so many exercise options in the Pasadena area, I sometimes wonder what makes my approach to training different from the others. What I often see is something like a Chucky Cheese experience. Lots of shouting, chaotic movements (think little kids darting every which way), and many distractions (lights, music, video screens). If you enjoy distractions such as these, then my classes are not for you. My approach towards training you is the same I use for myself. I go outside rain, cold, heat, whatever...and complete the training. No distractions. Is it effective? I believe so. Prices are for the entire month, and classes do not carry over. Contact me if I can help with anything. P.S. Current clients, if you haven't told me already please let me know if you'll be continuing in April. Thank you. I don't remember what the statistics are about New Years fitness resolutions, but it's around this time of year when you may feel like slowing down, or worse, quitting. We were just talking in boot camp last night, and I shared with my clients that I've been training 3-6 days per week since I was about 13 years old. That's 40 years now! I share this as a way to encourage you. This is not a sprint or a special or magical "X" number of weeks program. Being healthy is a day to day, year after year, no shortcut, commitment. Do what you need to do to keep training. Push past those feelings of laziness. Work on the commitment to yourself. Step by step, keep moving forward. Attack this day. Exercise on your own, or come join us. Our next camp starts on Friday, March 1st. Well, I had no idea how much of a challenge my daytime & nighttime schedule is to my exercise class schedule. I’m out again tonight till 12 or so to see a relative’s punk rock band perform at their first-ever LA show. I don’t think I’ll be up for class in the morning. Do you have any suggestions on how to get to sleep early or how to wake up on 5 hours of sleep? First of all, I love to sleep! And we have a big family and a lot of friends and my husband likes to go out 4 or 5 nights a week. (Good lord.) My solution used to be Just Say No to invitations. I can usually manage 2x per week but it always slides to more 3 or 4 events per week. Here it is, Tuesday & it’s already my 3rd night out this week, supporting family when I’d rather be reading & sleeping…. Also my doctor told me this week that I’ve had some bone loss in the past 5 years and need to increase my daily weight bearing exercise routine. Knowing that your doc has mentioned the increase in bone loss, I would make that a priority. Being out late, socializing but with brittle bones, is eventually going to break something. The body can only take so much before it says "screw you". Be selfish when it comes to your health. What good will you be to others if you are broken? Health is a top priority in my life. I want to be healthy for a long life with my family, plus my career/profession depends on walking my talk. And please know I'm not passing judgement...and neither does your body. Take care of it with proper sleep, quality food, and movement...and most of the time it rewards you with a vibrant and healthy life. Mistreat it, and you can anticipate problems. Implementation will be the challenge. I can't make you put your health first. My suggestion, take action now. Don't put off another day. Commit to you. Ultramarathon runner Nikki Kimball takes on the 273-mile Long Trail. Become more. N.Y. Times...Germs in Your Gut Are Talking to Your Brain. Scientists Want to Know What They’re Saying. If you’d like to receive these tips via email, you can sign up here to get my newsletter. And a reminder, regular classes on Presidents Day. 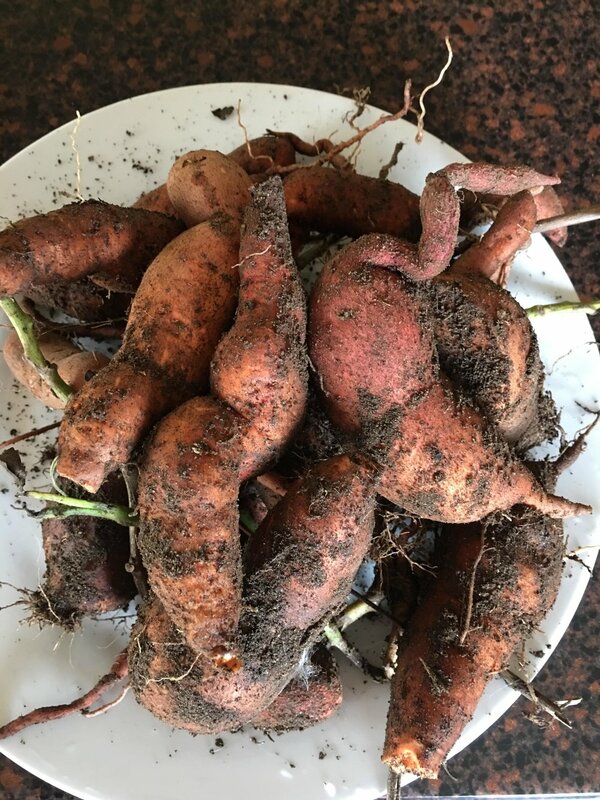 The above sweet potatoes are from our garden. And I just came across this article, “Sweet potatoes vs. potatoes: Which are really healthier?” via Precision Nutrition. Years ago I used to send out my newsletter only once a month. Yes, only once a month. It had about four sections, including a book review and a nutrition section. At that time, I really felt that once a month was enough information to handle for my clients. I laugh to myself as to how things have changed when it comes to the availability and the avalanche of information. I just read a "social media expert" who suggested that businesses post 6-7 times per day alone, on Instagram. Does more information produce better results or more happiness? When you are thirsty, you need a cup of clean cool water...you don't need a firehose blast of questionable city water. I don't believe that the incessant stream of breaking news, tips, photos, fads, and other interruptions really produce lasting results. It's like drinking a soda. Sweet and enjoyable in the moment, but fat producing and depressing in the long run. 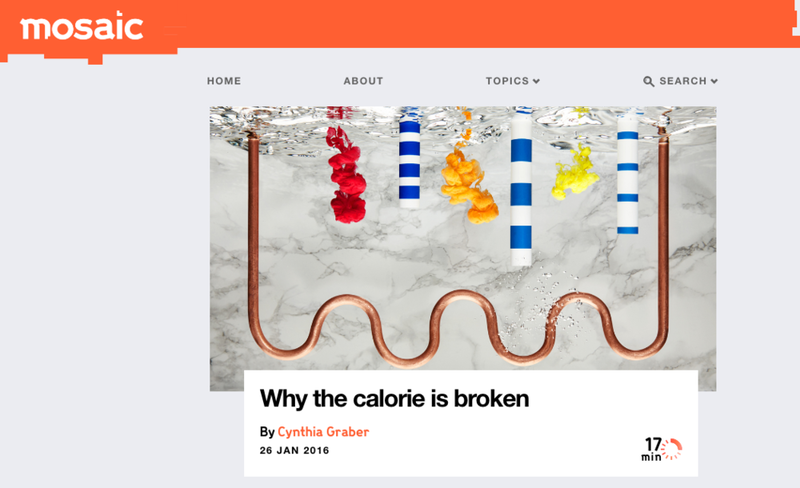 "A calorie isn’t just a calorie. And our mistaken faith in the power of this seemingly simple measurement may be hindering the fight against obesity." " Eat food, mostly stuff that has grown in Brazil for centuries, with other people." Contact me with questions, and to take part in our February Boot Camp. You may have noticed that I did not offer any New Years specials this year. Years past I have typically promoted my camps a bit more. I honestly prefer spending more time mastering my craft, rather than learning how to do Instagram and Facebook marketing. I’m sure that I'm in the minority, but at this point in my career, it’s just not the game that I want to play. With more and more overwhelm these days, I feel that my job as a coach is changing. It used to be that I would have a client follow an exercise program and refine their diet to a more healthy one...and the results would come. These days I see more clients almost at their breaking points. Job demands, always being available via text/phone/etc, traffic, news and social media 24/7, and on and on. Many are coming to realize that this pace is not sustainable, nor is it healthy. In 2019 my goal is to reduce the distractions and nonsense in my world. I'll be sharing tips and suggestions along the way. You are welcome to join me. Updated Jan 11… Just came across this short, related post on “Subtraction” from Derek Sivers, https://sivers.org/subtract. 2019 will begin my 10th year in running my Boot Camp. Training 3x per week for the month of January (13 classes) will cost you $175. Training 2x a week for the month of January (9 classes) will cost you $135. You may or may not wonder what I do when I’m not training with you in person. Well, a lot of my “off time” is spent learning. I always want to be aware of the latest, yet most helpful information when it comes to keeping you safe, while helping you progress. Here’s a pic from an online course I’m taking. Today I’ll probably spend a good 4 hours of learning. You know that this holiday month brings parties filled with food and drink. Do you have a plan so you don't get stuffed like a Thanksgiving turkey? Let me take care of the fat-loss programs, you just need to show up. Join us for this last Boot Camp of 2018! No classes on Dec 24 or 25th. Contact me with questions, and to secure your spot. And current boot camp clients, please confirm with me if you haven't already to let me know if you'll be training this month. I just signed up to do a Spartan Race on Saturday, December 8th. I’ve never done any race like this, but I’m up for the challenge. Sign up for the “early start time” on Saturday Dec 8th. Then, look for the team name "Boot Camp Pasadena". By signing up with the team name, we can all start at the same time. There is a $25 off coupon when using the code, CYBER2018. I challenge you to get out of your comfort zone and join me. While the Sprint is the shortest of the Spartan races, it remains a favorite among returning Spartans looking to push themselves beyond previous performances. Delivering 20 to 23 obstacles over 3 to 5 miles, it serves as the go-to introduction to Spartan Race. Trust us: Once you finish your first Spartan Sprint, you’ll be looking forward to your next—whether you choose another Sprint or decide it’s time to push yourself even harder and sign up for the Spartan Super. The host asked him, "what is the ideal protocol for longevity?" And to my surprise, the scientist answered, "probably work on relationships, and your support network. Decrease your stress, allow yourself more downtime...surround yourself with people who are supporting you...nutrition, exercise, getting outdoors." It was a reminder to me to focus on the basics. To put the work in. It's not the latest diet, or new exercise that will bring lasting and important changes, it's focusing on the basics. Don't be fooled by slick marketing and bikini-clad models on Instagram. If you're ready to put in the work, join me in November, for our next Boot Camp. No classes on Thanksgiving Day, nor the Friday after. P.S. Current clients, if I haven't heard from you already, please let me know if you'll be continuing in the November Camp. “Good workout today. I appreciate these switches between cardio + muscles. To get the weight off the fastest, your calories and macros would need to be set, and your daily intake would have to be adhered to very closely. Some people like to use an app such as My Fitness Pal, and track each thing they eat and drink. Yes, the weight will most likely come off quickly, but is the tracking worth it to you? Only you can decide. A simple and usually effective path is that of just eating protein and vegetables. Notice, this means no bread, no sweets, no ice cream, no sugar, it literally means proteins and vegetables, period. When you say that your diet has "mostly" or you occasionally "fall off the wagon" this will alter your progress. But once again, you'll have to make the decision...do you want to enjoy "treats" now and then, or do you want to the midsection area tightened up faster? There is no right or wrong, it depends on you. If the progress is slower than you'd like, know that you'll have to sacrifice more often. I feel that this is the best use of one's time. A short, intense, all-out workout that can be done at home, gets the job done. Longer duration classes may be "fun", but I prefer quick and effective. My second choice is a program called "Simple and Sinister". I know, intimidating title (marketing), but like the Tabata protocol, this is about getting the most calorie bang for your buck...and once again this can be done at home. No traveling, no driving...just knocking out the workout. This workout includes "get-ups" which will need some instruction, but the kettlebell swings can be done alone. The workout usually consists of either 5 or 10 sets of 10 swings - done with full concentration and with a challenging weight. I hope this helps. We can talk more about it when I see you in class. It’s now 11:35 in the morning, and I am going through my daily process. Before noon I try to send out a copy of the workout we did along with notes and things we may have discussed in class to those who missed. I also check in to see why clients missed…it’s part of the accountability that I provide. These classes are more like personal training. Clients are expected to show up on time, and on their planned workout days. Of course clients may be traveling, and sometimes out sick, but I still check in. Results don’t come from haphazard attempts…they come through strategic and consistent efforts. 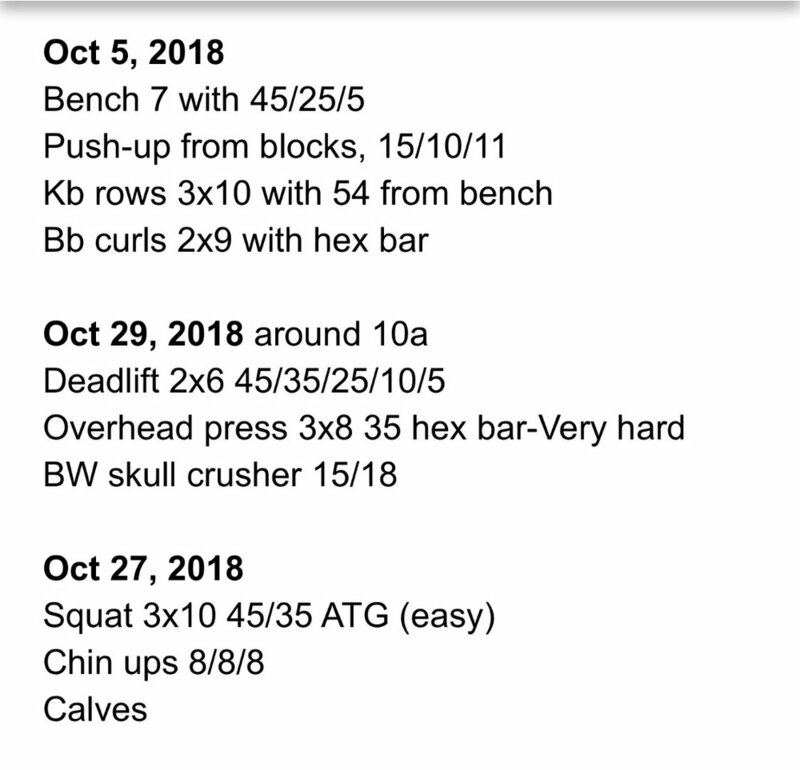 Here’s what we did today, in case you are interested or would like to have a free workout. Enjoy! Do you have a plan to reach your fitness goals? Is it detailed and well thought out, or do you just kinda do things whenever you feel like it? I'm going to share with you my personal plan, and some suggestions on how to build your own plan. I've learned through trial and error what works best for me. As I've aged, my training is still strong and the weights lifted are the same or better, but my recovery time has increased. I usually lift heavy weights, with low reps, and low sets only 3 days a week...usually Monday, Wednesday, and Friday. On my off days, I usually do a little Tabata style cardio, and maybe some ab work. That's it. Week after week. For your plan, I'm going to assume that your goal is fat loss. For those who have a specific goal, like run a half marathon, or climb Mt. Kilimanjaro...you will need more specific programming. First, look at the upcoming month. Will you be traveling? How about upcoming stresses at work? Family obligations, parties, anniversaries? How about any social events, concerts, games? Put these into your calendar, and realize that these events may derail you. Plan if you'll need to bring equipment while on the road, or have routines that you can do with bodyweight only. My suggestion is to get in at least 3 strength training sessions per week. In my opinion, these provide the biggest bang for your buck. You'll build muscle which will burn calories during exercise, as well as when you are not exercising. Remember that resistance training should take priority over cardio. If you can fit in cardio on other days, then mix it up. One day try high-intensity interval training (like alternating sprinting and walking for 7-10 minutes), or maybe a long bike ride or hike with your family or friends on the weekend. If you need to, mark your calendar with your planned workouts. Most importantly, execute and stick to your plan. If you need more suggestions or have questions, contact me. If you'd like to take advantage of the Boot Camp classes that I offer Monday-Friday, here are the details for October. Oct 2 - Tuesday/Thursday Camps Start, Cost is $135 (9 classes) Email me with questions. P.S. Current clients, if I haven't heard from you already, please let me know if you'll be continuing in the October Camp. “You are on the right path. Know that I've been working out since I was about 13 years old. I can say that I've trained at least 3 days, up to 7 days a week during this time. I just turned 53 last week...so that's 40 years of training. I've learned to "judge" myself on the effort and consistency of work that I put in. My effort may vary from day to day, but for the most part, I give it 100%. Results will come over time, but to set a specific goal of pounds lost, or inches lost, is often a setup for failure. Be committed to yourself. Dig in, and do the work. You'll get stronger, and your body will thank you. It will appreciate that you are training it, and improving it. I’m always looking for ways to give you the best training experience possible. Starting today, if you are a full time client, and miss your class, I’m going to send out (via email) the workout that we did, and also what we discussed in class. I sometimes share helpful books, articles, etc. with clients, but don’t always share with the entire class. I will add these in a “notes” section. P.S. Don’t forget, if you miss your regular class - email me why you missed. I want to know. Did you sleep in, traveling, injury, etc.? I can work with you if I know what’s going on. While you were sleeping, boot camp clients were warm up to this. There is no perfect diet for everyone. I smile when I see other Boot Camps and trainers in the Pasadena area that pretend they have "the" diet for you. We all seem to be looking for something to help us feel better and perform our best, and as a species, we seem to have a limitless credulity for new ways to do so. The only way to know for sure is to have your blood work done with a sports medicine doc, or at a sports specific place such as InsideTracker. I had my own blood work many years ago from a sports med doc who worked with a lot of MMA fighters. He wrote up the instructions for the blood draw, and the results were sent to him. Then we looked over the results over a phone consultation. It was very eye-opening. I remember him saying that just taking supplements without the results from a blood test was "just guessing, and a way to have expensive urine." So what do you do if you can't afford or don't want to have your blood drawn?